State Road 30A is a 19-mile stretch in the Florida Panhandle famous for two things: Seaside (New Urbanism’s first town that also served as the set for “The Truman Show”) and 16 rare coastal dune lakes (that famously breach the dunes on occasion to combine with the gulf; similar bodies of water are found only in Australia, New Zealand, Madagascar and Oregon). But now, 30A is home to some really good beer. 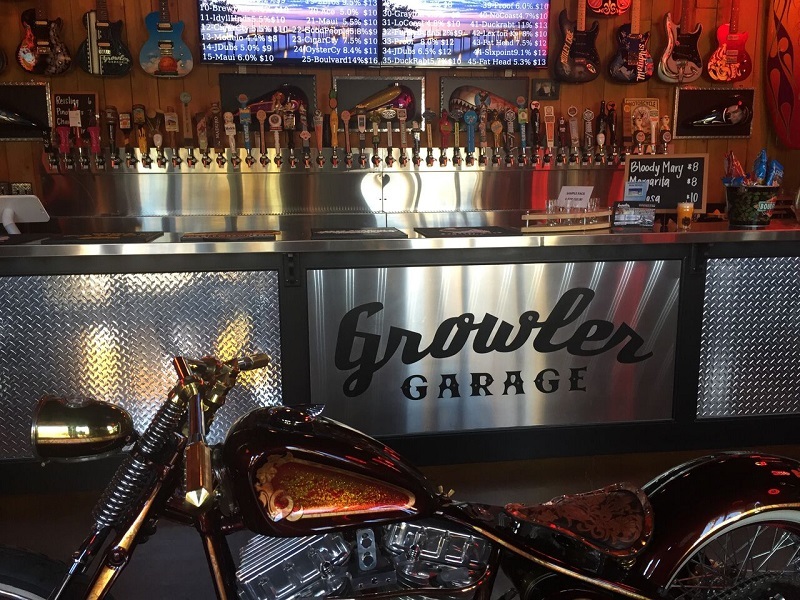 At the west end of the road, Growler Garage (4368 West County Highway 30A, Suite 101, Santa Rosa Beach) is a taproom that looks more like a cluttered gallery for motorcycle enthusiasts, music aficionados and surfers with an obsession for Southeastern Conference football teams. In fact, it’s hard to even notice the three dozen taps on the back wall, as the custom-painted motorcycles and guitars—not really the gaudy looking surfboards—serve as beautiful distractions. But the owner, a renowned custom painter of motorcycles, didn’t intend to distract from the beers; partly, he opened the Growler Garage to bridge the divide between the motorcycle-riding, Budweiser-drinking folks and the world of small-scale brews. So while someone might pull up on a chopper to admire the skulls adorning some bike or the provocatively painted gas tanks in the back room, they might also abandon predilections and sample beers from some of the independent, mostly Floridian beer makers. 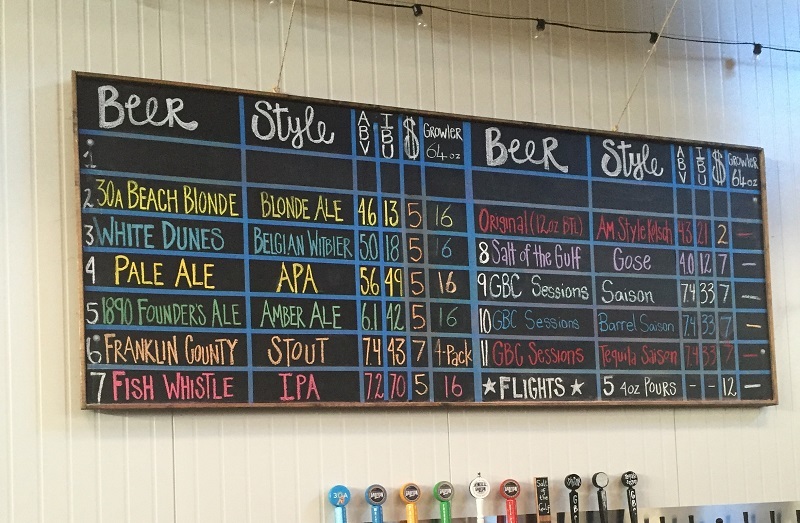 While Growler Garage rotates beers out weekly, it’s one of the few places in the area where you can drink beer from Oyster City Brewing Co., which is, as of now, only kegging. At present, Oyster City has about 1,000 kegs circulating in the Southeast. On tap was First Light of Day—a blonde, steeped with Florida orange peel—and Lemon Shark Wheat, both of which paralleled many of the popular brands and served as good gateway brews. But of course the Garage had much bolder and bitter choices, too. Best were Divide and Conch’r by Idyll Hounds Brewing Co. (South Walton) and Eight Five O and Mango Wit from Proof Brewing Co. (Tallahassee). While the numbers indicate that small-batch beer is making small gains in this region, the statistics feel ostensible as you continue down 30A. 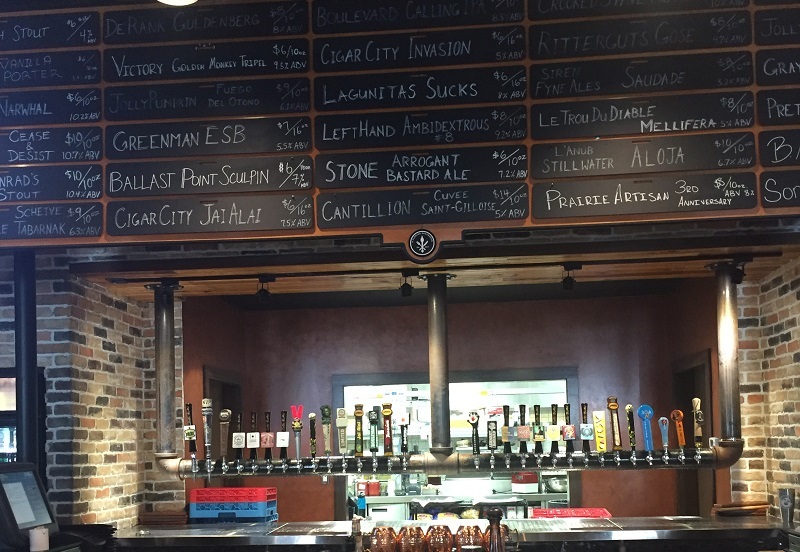 In Santa Rosa Beach, the newest resident of the town is the Craft Bar (170 E County Highway 30A), which opened in April. The Craft Bar opened its first location in Destin two years ago and has since opened three more around the state. The establishment on 30A serves 29 rotating beers, along with the ever-present (and around these parts, completely ubiquitous,) 30A Beach Blonde, a creation from the largest local brewery, Grayton Beer Co. The Beach Blonde is a beer that nearly every drinker can get behind: smooth, refreshing, light and complementary to Florida’s weather. But of course most guests don’t visit the Craft Bar for the Beach Blonde, as the selection runs an incredible gamut. From wildflower honey meads like Dwarf Invasion from B. Nektar Meadery to Ritterguts Gose from Brauhaus Hartmannsdorf, a beer with hints of coriander and salt—tasting the beer on tap feels more like a cultural journey than a Panhandle dining experience. Expensive beachfront property is no place to operate a brewery trying to succeed. Away from 30A, in the less scenic and more affordable South Walton Business Park, stands Grayton Beer (217 Serenoa Rd., Santa Rosa Beach). Grayton brewed 4,000 barrels in 2014 and 9,000 barrels in 2015, and the estimate for this year quintuples 2014’s production. Open to the public from Thursday to Saturday, Grayton—which is a short drive from from Idyll Hounds—is a good place to sample the lineup, including the trio of BBC-inspired “GBC Sessions.” These inventive beers do everything, from spending weeks in tequila and chardonnay barrels to marrying the flavors of dragon fruit and lemongrass. Better, however, are the core beers, which are inspired by the area. The Franklin County Stout is brewed with about 600 Apalachicola oysters, while the gose Salt of the Gulf has, as the name implies, salt from the gulf. Beer making in this region is new and experimental, as everyone involved is still learning the process and logistics of production. “We harvested [the salt] the first time, but will never do it again,” Jamey Price, the founder and owner of Grayton, says. He’s more cognizant now of things like red tide and a brewer’s proclivity to enjoy too many beers at the beach. Using a local harvester, he explained, avoids any of these complications. Consumers in the region need time to learn about the product, too. As Grayton brewer Tyler White posits, the problem isn’t making good beer. “You’re battling market perception,” he says. Besides local brewers having to mind their hops and roast malts gently, they also have to consider packaging, for example. One reason Grayton hasn’t started canning is because the brewery speculates that the public in this region will view canned beer as a second-rate product because of the incorrect perception that cans are inferior containers. But, behind the scenes, Grayton is doing what it can to introduce an untapped market to very tappable beer. Its quality control manager, for instance, has a PhD in microbiology and the lineup comprises introductory beers, as well as brews with more complex notes. “You want to be able to embrace where you are,” White says, which involves an understanding: it takes time or the right conditions for two disparate bodies—like Coors drinkers and craft beer; coastal dune lakes and the Gulf—to come together. Reporting for this article was made possible, in part, by travel, lodging, and other accommodations provided by the Visit South Walton Tourism Board. Noah Lederman writes the blog Somewhere Or Bust and is the author of A World Erased.